After last weeks success at Cookstown I couldn’t wait for Tandragee to see if we could continue my good start to the season. There wasn’t much in the way of jobs to be done to the bikes in the days between, the most important was to repair the Supertwin belly pan as a hole had been burnt through it by the exhaust. Luckily I know a very good body repair and paint sprayer, so thanks to Adrian for a superb job, as always. We arrived at Tandragee on Friday ready for practice, and the paddock was such a state we were towed in by a tractor. First out was the Supertwin and after two laps noticed a slight stutter from the engine as I opened the throttle. It got to the point that I pulled in as couldn’t clear it. Next I was out on the 400. I was really looking forward to seeing if all my hard work over the Winter had paid off. The engine felt great, strong and solid and was really enjoying the ride. I looked down at my foot as if felt like it slipped on the footpeg. Sure enough there was oil everywhere, so pulled in. The rear of the bike was a mess, on the plus side it won’t rust anytime soon as is now well protected. Steve studiously cleaned her up and we thought the leak was coming from the water pump seal, so removed this and made sure we had a good seal. Sadly only having one practice for this bike we would have to wait for race day to see if our efforts worked. On the plus side even though I only did two laps on the 400 I had managed to knock 3 seconds off my previous fastest lap around the circuit, so was hopeful for race day of an even better time. Next I was out on the Supertwin again. Sadly this was short lived as the electrical problem was still there, despite changing the battery, which we thought was the cause, so I had to pull in again. Back at the van we found that the fault was linked to the coil so changed the spark plugs and cleaned all the connectors up, which did the job as didn’t suffer during the race. We had been keeping a close eye on the weather all week and our fears were confirmed come race day, it was wet, very wet,in fact it was the wettest I've ever raced in. With wets fitted I was out on the Supertwin. I got away well and started reeling the guy in front of me in and after watching to see where was good to overtake, I got passed him. Around the next corner red flags were being shown after an incident. Luckily there were no serious injuries, it was just stopped to allow the marshals to clear up. So after the restart I managed to overtake the same guy, we started in our original grid position, a lot quicker as knew from the previous lap where to overtake, I then started to hunt the next guy down. I was soon behind him and managed to get passed with ease. I got my head down and tried to settle into a rhythm. 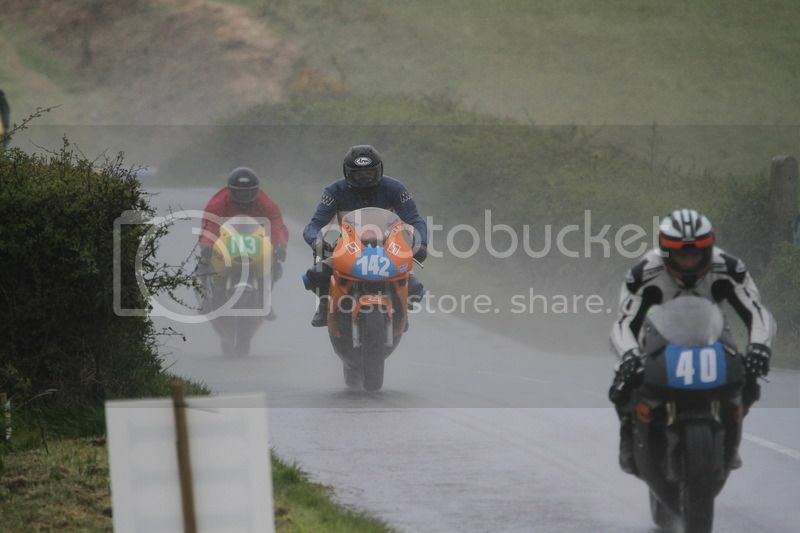 I’ve never raced in such wet conditions and surprised myself as to how much you can get away with on full wets. Coming into the last but one corner, the last guy I overtook came up alongside me. I thought he was way back, but sadly not, so got my head down and went for it, as he didn’t get passed me. I tried to ride a very defensive line into the last corner but sadly was pipped to the finish line by about half a bike, still was a cracking race. I caught up with the rider later, and he said his head had gone, when I overtook, as he didn’t like the conditions. He then told me that he thought that as I was doing it, so could he, so just tucked in behind me and let me lead. This is always a good ploy in the wet as you can gauge how wet it is by how the bike in front is handling. The old racing adage, is that you only have to lead over the line on one lap to win. After trying to get warm it was out on the 400. She was warmed up nicely and no signs of leaks so headed off to the grid. I looked down to see if all was ok and saw the belly pan full of oil, so our fix had not worked and it was back to the pits for me. We found out that the main gear box seal was the culprit, and with no spare that was that for the 400. Still one more race to go on the Supertwin. I lined up next to 113 again, hoping to make up for missing out to him in the last race. We both got good starts and started a 4 lap dice between us. It was a great race and we both thoroughly enjoyed it. I followed for most of the race but did come alongside him a couple of times until I picked my place to overtake him. Sadly in doing this I was off line for the next corner, leaving the door open for him to sneak passed and holding the position until we crossed the line. It was an excellent race and great fun, despite the weather, but I did surprise myself how quick I could run in such appalling conditions. It was a shame that I haven’t managed to race the 400 this time, but fingers crossed she will be ready for Skerries in July. Still I’ve had a great few races on the Supertwin and hope can continue to do so next time out.